Food is not properly the stuff of the cinema–it often functions as a prop, an expository device. 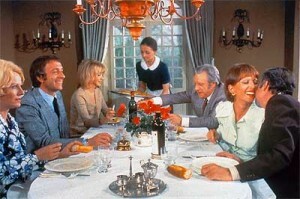 In Dinner at Eight, The Man who Came to Dinner, and Guess Who’s Coming to Dinner, the actual dinner is shortchanged. To make food the subject of the camera– to linger on a close-up of a perfectly cooked and garnished porterhouse, to isolate the audible crackle of sizzling bacon–is to take us out of a world of characters and plots and rub our noses in the succulent sights and imagined smells emanating from the screen. When food or feast is displayed as spectacle, it provokes our desire, sometimes our disgust. When foregrounded as a narrative device, food can serve as a marker of class and culture, and eating can become a social adhesive or a universal symbol for consumption. But films can play with these conventions, turn them on their head. In The Discreet Charm of the Bourgeoisie, it’s the relentless deferral of a meal that exposes the characters’ inner lives. In Diary of a Country Priest, it is the deprivation of food that constitutes a profound but tragically unnoticed martyrdom. At what point do cannibal films and vampire films crossover into the genre of the food film? When does the image of rotting flesh become something that we reluctantly consume, both as spectacle and as food? For this Spring’s edition of Cinematheque, we were looking for presenters to screen films that not only indulged and overwhelmed our gustatory sensibilities, but reminded us that we see with our taste buds as well as our eyes, that we think with our stomachs as well as our minds. In other words, we wanted to push the boundaries of taste.